The San Diego Association of Governments completed major work Thursday morning on a new bridge that spans Interstate 5 at Gilman Drive in La Jolla Village. 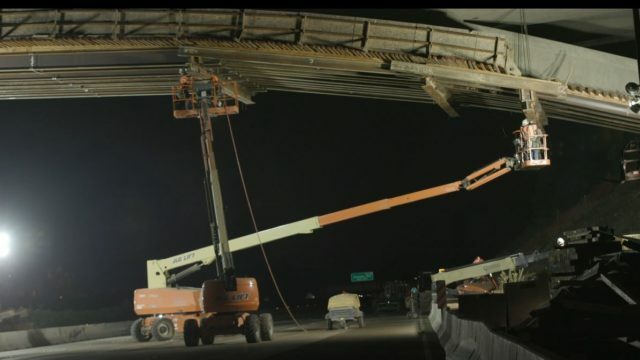 SANDAG and Caltrans have been finishing work on the bridge over the past three weeks, removing wooden structures that held it up during construction. The work caused multiple five-day overnight closures of I-5 in late October and early November. The bridge will connect Gilman Drive and Medical Center Drive, allowing a second I-5 crossing for UC San Diego students, faculty and staff to reach the campus’ footprint on both sides of the interstate. SANDAG expects the bridge to open for public use in 2019. The bridge is part of the Mid-Coast Trolley Blue Line Extension, which includes an 11-mile extension of trolley service by the Metropolitan Transit System from Old Town to University City and through Mission Bay Park, UCSD and Westfield UTC. Construction on the extension, including the new bridge and nine new trolley stations, began in 2016 and is scheduled to be fully completed in 2021.